James "Jim" Dunlap, age 56 of Austin passed away October 28, 1999. Jim was employed by the Texas Department of Transportation. He is survived by wife, Karen Dunlap, and son, Robert Nelson Dunlap of Austin. Prayer Service will be held 7:30 p.m., Sunday, at All Faiths Funeral ServiceNorth Chapel. Mass of Christian Burial will be celebrated 10:00 a.m., Monday, at St. Louis Catholic Church, with Rev. Fr. Larry Covington officiating. Burial will follow at Capital Memorial Gardens. In lieu of flowers donations may be made to Hospice Austin. Obituary published October 31, 1999, in the Austin Statesman. 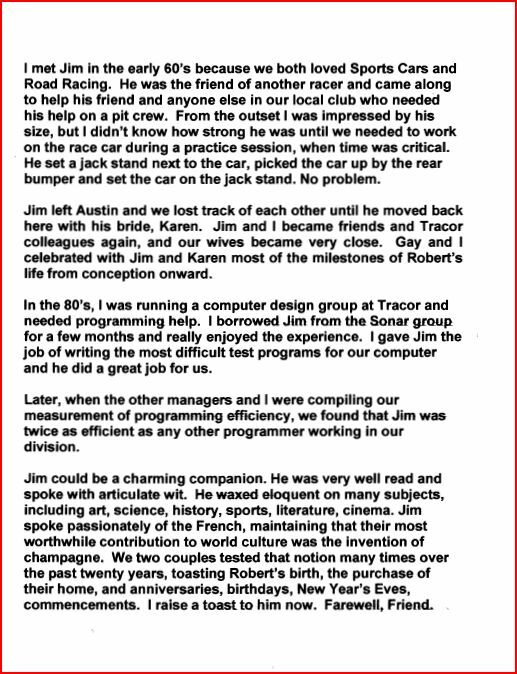 The following Eulogy was delivered by Jim Dunlap's Close family friend, Terry Chapman.